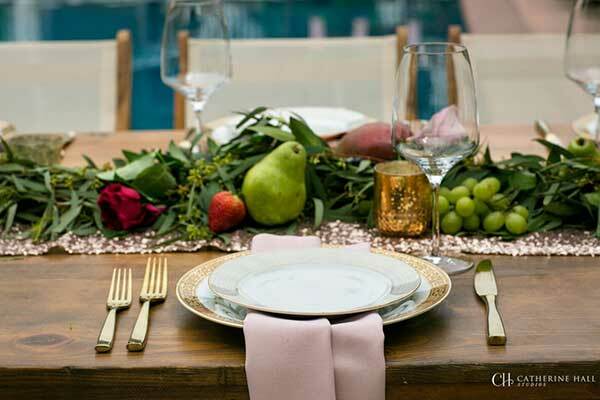 Also known as a seated dinner, a plated event is a more traditional and more formal option than a strolling reception. If your families tend toward the traditional and prefer a wedding reception with a sit-down meal, then a plated event might be your best choice.Your guests will definitely enjoy being pampered by this dining style. Romesco Sauce, roasted peppers, tomatoes, hazelnuts, toasted garlic and smoked paprika. Flaky & savory homemade empanadas with creme fraiche. Finished with red chile butter, served with a remoulade dip. Baby spinach, grilled peaches, red onion, fresh corn, goat cheese, pecans, and fresh basil, honey balsamic vinaigrette. Served with whipped butter & pink sea salt at each table. Wild mushrooms and herbs, beef jus. Pan seared, citrus fruit compote & herb butter. Herbs, spinach, mushroom and fontina cheese, natural jus. Roasted portobellos, eggplant, zucchini, spinach, fennel, on a polenta cake with a sweet pepper tomato coulis. Seasoned and roasted to perfection and artfully presented. Each decoratively displayed in a clear glass apothecary jars.